Bude in Cornwall, has a reputation to rival Newquay as a holiday destination with great beaches and facilities for visitors. The focus in Bude is on traditional family 'bucket and spade' holidays with the option for surfing, while in Newquay it is the other way round. Visitors come to the Bude area to enjoy the excellent beaches and relaxing atmosphere. There is an abundance of good accommodation in the area and some visitor attractions within a short distance by car. At the centre of Bude is Summerlees beach which is wide, sandy and gently sloping. Crooklets beach is ideal for surfing and Sandymouth is recommended for beginners. 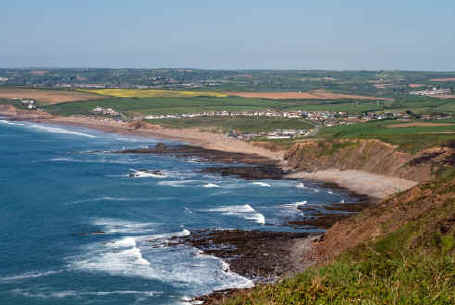 Nearby is Widemouth Bay with a long sandy beach. 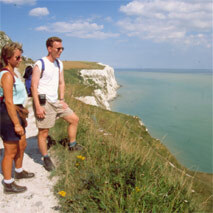 The area is fringed by towering cliffs which offer some excellent walking and views of the coast. Wide open spaces - even in summer! There is also crazy golf, pitch and putt and crabbing from the quay. Places to visit along the North Cornwall coast include, Crackington Haven, Widemouth Bay and Hartland Point. Other sections of the guide you might also enjoy - see below. Whether your idea of an ideal activity is sunbathing or you prefer something more strenuous, the chances are that you will be able to pursue this at the coast. There is a wide selection of activities that can be found on our coastline - these range from a gentle stroll to the next bay, to swimming and snorkelling, to more energetic activities such as sailing, surfing, windsurfing and kite sailing. See Activities section. A huge selection of attractions are available within the coastal area and this section will have details of many of them. From piers and harbours to fun fairs and roller coasters, the listings will have details of what's available in your chosen area. For details of attractions look in the resort pages. We will bring you feature articles about the coastline and news items about life in the coastal area. contributions to this section are welcome.